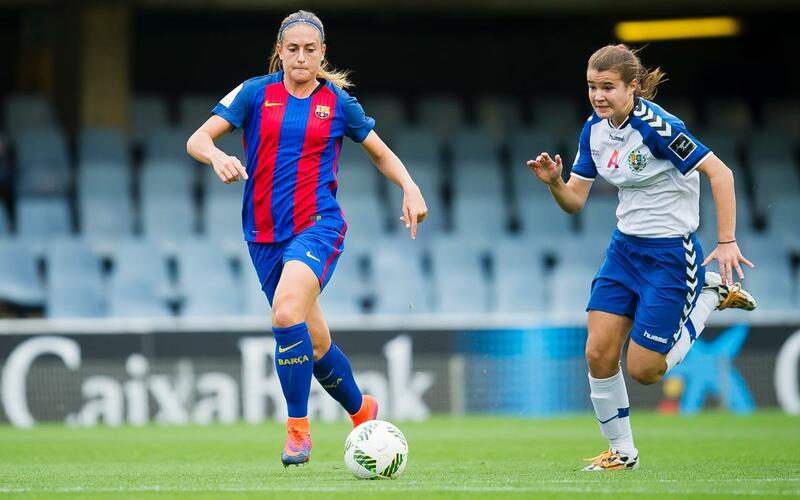 The Barça women’s team left it late to pick up a fine victory against winless Zaragoza at the Miniestadi on Sunday afternoon. They may have looked the better team right from the kick-off and thoroughly dominated the possession, but with just seven minutes to go, they still hadn’t managed to turn any of that superiority into goals. It wasn’t that they were finding ways through the tightly packed Aragonese defence, but despite plenty of chances, not one of the many, many attempts found the back of the net. All that changed in the space of six minutes. And not just once but three times in quick succession. The first goal came from the penalty spot, converted by Jenni Hermoso and celebrated with both elation and relief. The goal shattered Zaragoza, whose heads clearly dropped for the closing minutes and were punished for it. Alèxia Putellas delivered a delightful chip into to make it 2-0 and then Jenni Hermoso added her second of the day to absolutely certify three points that leave the Blaugrana top of the table with a 100 per cent record after the first five games. What’s more, Barça have scored 19 goals and conceded none. The win tops a wonderful week for Xavi Llorens and his team, who also won 3-0 midweek in the first leg of their Champions League round of 32 fixture with Minsk. The Miniestadi hosts the second leg of that European encounter on Wednesday.